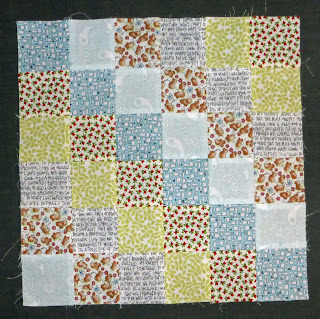 It seems like forever since I have had the opportunity to get some sewing done. Thanksgiving was filled with family and cooking and cleaning. 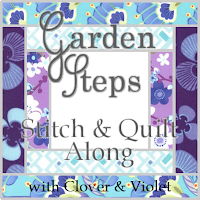 I took the week off of work but it was filled to the brim with the holiday festivities and our youngest daughter was home from college so it was a pretty busy week here with no sewing. I made my first ever Scrappy Trip Blocks this weekend. 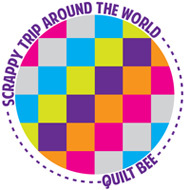 I am taking part in the Scrappy Trip Bee hosted by Julie at 627HandWorks . 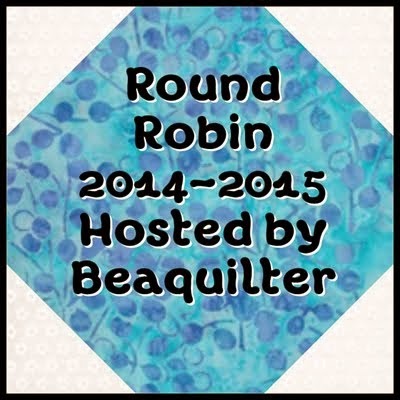 She hosts them quarterly and sign ups for Round 4 are Feb 1st to the 6th. You can sign up for as many or few rounds as you like depending on your needs and time. They really go together pretty fast so I will be taking part for a while depending on how big a top I will be making out of them. 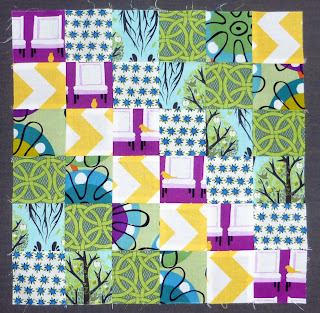 Each time you make six blocks ( one to keep for yourself and five to send to hive members). Everyone requests what colors they would like to see in their blocks. So fun pulling fabrics to fit each one's style and preferences! I recently got the Tula Pink Raccoon and the lavender circles in a scrap pack from Hawthorne Threads and thought they filled the bill for fun. Those raccoons are just too cute!!! 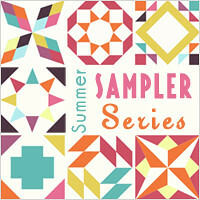 These scrap packs are on sale right now for $6.99 and contain close to two yards of fabric. I was very pleased with the assortment I received and plan on buying more if the sale lasts long enough to make it to my next payday :) I think I have an addiction that needs professional help...please don't tell a sole though.. I kind of am enjoying this habit of adding to my stash every chance I can lately!!! A year ago I am not even sure I could have explained low volume...yet alone find it in my stash. But thanks to my addiction (lol) I am now the proud owner of an ever growing stash of low volume. I like to add for quite a while before I start to use it though---so I wasn't sure what to start out with. I have yet to really make a low volume block of any sort. I hope it isn't too obvious. I have had these little mice for quite a while---long before low volume was a catch phrase and they were too cute not to include in this block...They did make it challenging to pull additional fabrics in though. 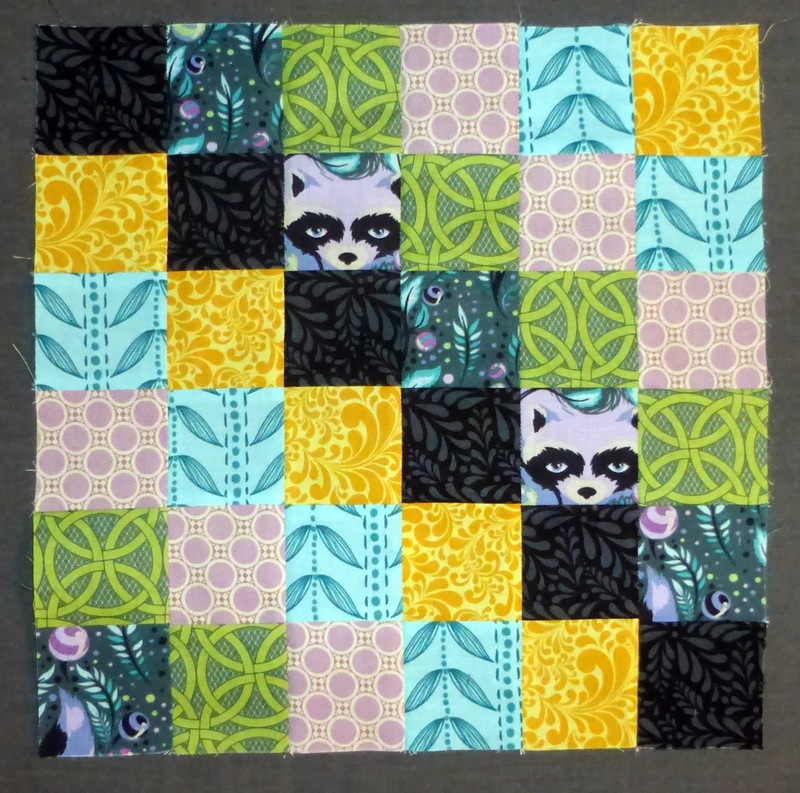 These scrappy bee blocks seem to have a bit of a learning curve on balancing a person's color wishes with the scrappy look. I found that if I didn't watch it they can easily get too color coordinated and then look out of place when additional blocks are put next to them. In Sheila's block above the overwhelming desire was to add another teal or lime color to the block but when looking at her other blocks---yellow seemed like the right choice. I also found that I rather like the longest diagonal to kind of be the darker value---kind of hard to determine with low volume!!! Here is what I came up with. I hope Emilee likes it. Here the blue in the little mikes print seemed the darker value. That's the funny thing about low volume---you would think all those brown mice would make it the darker block but to me it certainly looks like a white print---even with all those mice. The red flowers don't even seem as dark as the blue background...so down the center it went. I have a lot of brights and had fun with this one. I bought the purple print with the white chairs a year ago and haven't found the right project for it yet. 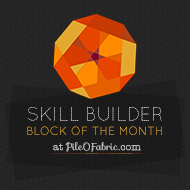 This block was ideal for it. White, bright and aren't those birds on the chair fun. 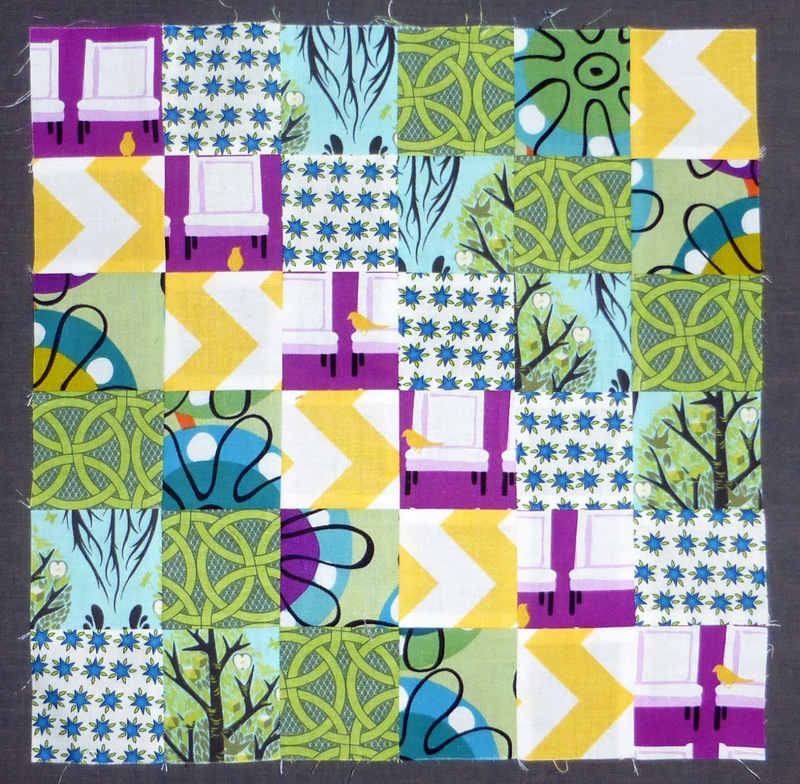 The tree of life print and the yellow chevron were also in the scrap packs I got from Hawthorne threads and I thought they added a fun element to this scrappy block. 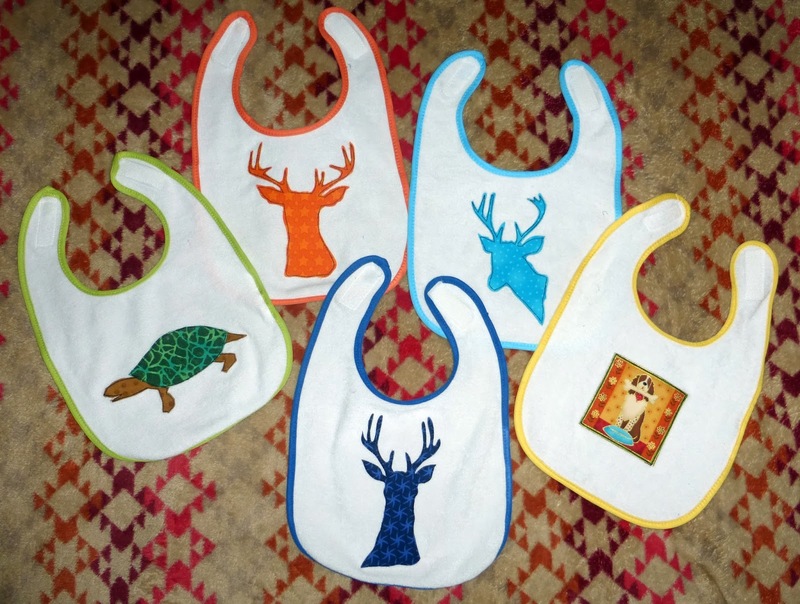 Then I have been putting off appliqueing a little something on these bibs I picked up at Ikea this Summer when my daughter was expecting a baby. I thought I could finish them up and add them to a Xmas present for the little one. Before long he will be eating and making messes and these will come in handy. 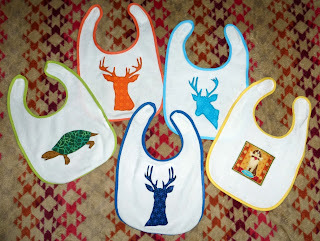 I wasn't sure what to put on them but am sure the deer will be a big hit with my grandson's mommy. Feels good to finally tick a couple of to do's off the ever growing list!! !